As you’re browsing our 4 seater square garden table sets, notice the sections below the photo gallery where we offer you some incredible discounts on complimentary products. If you purchase any of our 4 seater square garden furniture, you’ll be able to get up to 80% off our quality garden furniture. Folding garden tables, metal benches, bistro sets and sun loungers are all up for grabs at fantastic prices. If you’re looking at the Lucy table, you’ll find offers on cushions and parasols that go with it. Make your garden chairs even more comfortable with seat pad cushions or high back cushions in an array of different colours. Add a parasol to provide your garden table with some shade. These too come in a variety of colours. Combining these wonderful, practical extras with your main purchase of a 4 seater garden table and chairs means you get them at a much better price than buying them separately. So find your perfect garden furniture set now, and remember to take advantage of our fantastic offers! We have a variety of different styles available when it comes to our 4 seater square metal garden furniture. We have classic style garden tables, sleek contemporary tables with a glass table top, and steel bistro sets. Apart from the steel bistro sets, our 4 seater metal garden tables are made from cast aluminium. This light yet sturdy material is weatherproof, making it an optimum choice for garden furniture. It doesn’t rot or splinter, as wooden furniture sometimes does. It doesn’t rust like cast iron and some other metals do. This means no sanding, varnishing, covering or hauling your garden furniture to shelter. Leave your aluminium garden furniture set outside all year round without worrying about maintenance, and spend more time enjoying your garden. The Lucy table is a smart 4 seater garden table with a lattice table top and central hole for a parasol. It measures 91cm and weighs less than 16kg so you can easily move it around your patio to find the right spot. The Lucy table can be paired with the Rose, Jane or Kate chairs if you prefer these to the April chair. If you like a more modern look, and appreciate functionality, you’ll love the Chloe table. This elegant 4 seater square garden table and chairs features a tough glass table top, fitted onto its cast aluminium frame. The stylish Chloe table is a versatile garden table that looks equally beautiful outside on the patio as indoors in the dining room. It’s also an extendable table, and by extending 90cm to 180cm it goes from seating 4 to 6 people. It comes in grey, black, White and Grey, and White and Champagne. Our steel bistro sets come in our classic colours, so if you like our other models of Antique Bronze garden table the Zara bistro set could be for you. This simple little table is perfect for a patio or a balcony. Both the table and chairs fold away, so it’s a real space saver. It measures 60cm2 and comes in Antique Bronze, grey, black, and white. Our bistro sets come with their corresponding folding chairs as standard. Our other styles of square garden furniture come with a choice of chairs, however. 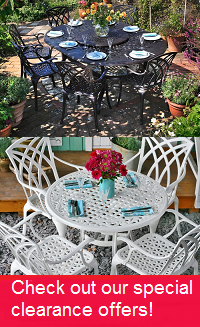 So once you’ve chosen the right 4 seater garden table set for you, choose which chair you prefer. A default chair will be available at no extra cost, but take a moment to consider others, such as the Emma, Rose, Georgia or Abigail chairs. You can pair one of these other chairs with your square 4 seater table for between £5 and £25 per chair. These garden chairs are made of the same weatherproof and robust cast aluminium as the tables. Some combine cast aluminium with a hard-wearing outdoor mesh fabric. Delivery is free on all our 4 seater cast aluminium garden furniture. So there’s no need to worry about extra charges on the checkout page. Our aluminium garden furniture sets are delivered as a large package or on a wooden pallet by our partner couriers Parcelforce or Geodis. Both offer online tracking of your order from the day of dispatch. Geodis will also call you the day before delivery to arrange a time slot that works for you. For details about delivery you can have a look at our delivery information page or give us a call.